Sharing is not a strange idea for ordinary Vietnamese, but big-scale altruism is rare so far, given that serious wealth accumulation started in Vietnam only in the past two decades. This is an issue I’ve discussed with some of you over the years. First, make money and lots of it, thanks to the economic reforms that date to 1986, secondly, show everyone how successful (i.e., wealthy) you are and, thirdly, begin to ponder your legacy. In the final analysis, quite literally, we all have a finite number of days on earth and not many of us want to be the richest person in the cemetery. This is the next logical step after the conspicuous consumption of the nouveau riche phase, which is in full bloom. There are only so many houses you can live in, cars you can drive, clothes you can wear, and trips you can take. Who better than Bill Gates, one of most famous and respected people in Vietnam, to provide the spark? A sure sign of Vietnam’s economic development is that the country is now producing notable philanthropists. 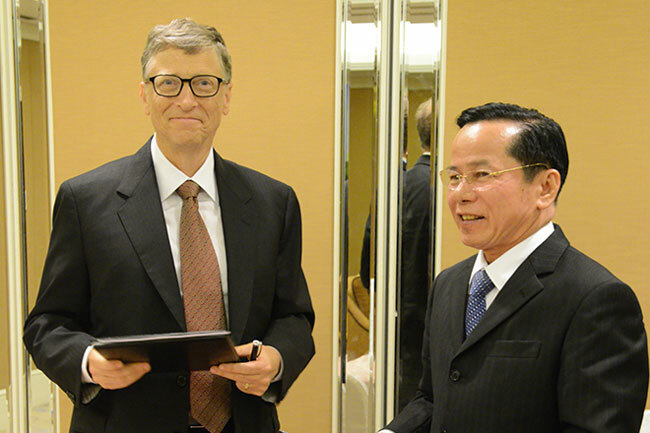 In April Le Van Kiem, chairman of the Long Thanh Investment & Trading Corp., became the first Vietnamese to join forces with Bill Gates, the philanthropist and Microsoft MSFT -0.7% co founder. At a meeting in Singapore the two agreed to set up the Vietnam Health Fund to improve health care in the country. Le pledged $5 million over the next five years, and the Bill & Melinda Gates Foundation will match each dollar, as well as all other donations from local philanthropists. The goal: $50 million. In May foundation officials organized a meeting in Ho Chi Minh City with other wealthy individuals to round up support. My prediction is that this budding philanthropy movement will gain significant momentum as the movers and shakers of today come of age. I expect to see large sums donated and invested in high priority areas such as health care, education and rural development. A little goes a long way here and people of means can leave a legacy by improving the quality of life for countless people. Follow this link to read the rest of this 25 June 2014 Forbes article. Note that it mentions the new Fulbright University – Vietnam (FUV) as a possible beneficiary of Vietnam’s nouveau philanthropists.